Careers Cost > How Much Does Billboard Advertising Cost? Billboard advertising offers a company the opportunity to show their message to thousands of people while on the road. Placed on elevated boards near the roadside, this advertising method can be visible to both pedestrians and/or cars. Billboard advertising costs can be very different depending on the location of the billboard. Areas with higher traffic can cost more when compared to a billboard that is placed in an area which generates little traffic. The price can also increase depending on the duration of the contract you sign with the advertising company. Because of these different factors, the price of billboard advertising has a very wide range and can cost anywhere from $200 to as much as $150,000+ per month. Refer to our table below to see what you may pay. Digital billboards, which display a message every eight seconds, will be much cheaper, often costing $2,000 to $8,000 per month; again, depending on the factors we have mentioned in the guide. Digital billboards, to some, can be more dynamic since it captures the driver’s attention as they drive by. It can also be more targeted since the ad can change at any given notice. Mobile billboards, which as the name states — is mobile — will be plastered on the side of a truck as it drives up and down a busy area. Depending on the area, this can cost anywhere from $800 to $3,000 per eight hour day. According to FitSmallBusiness.com, they say a four-week billboard in Baraboo, WI, could cost $250, while a billboard for four weeks in New York City could cost more than $14,000. The Grasshopper blog did some in-depth research and had found in their city of Boston, it would cost $11,000 to $23,000 for a four-week ad, while in San Diego, it could cost $8,400 to $15,000 per four weeks. To see what it may cost in your local area, play around with this Lamar Inventory Browser to see what a billboard may cost. NOTE: Prices are going to vary depending on the location and the company offering the billboard. The more cars that pass the billboard, the more it may likely cost; however, this isn’t always the case as some billboards could be in high traffic areas but it won’t be as visible to the cars driving by. Like any advertising, the age, gender and income level that may pass the billboard can affect the cost. If you were to advertise to a higher income level, then it could cost much more than advertising in a lower income area. Like the circulation, the size of the ad, the visibility and the speed passerbys are traveling can also affect the cost. Depending on the area, some months may be costlier than others. The longer you commit to your billboard purchase, the more you may be able to save. Designing and printing the billboard are separate processes which can be done by a different company. 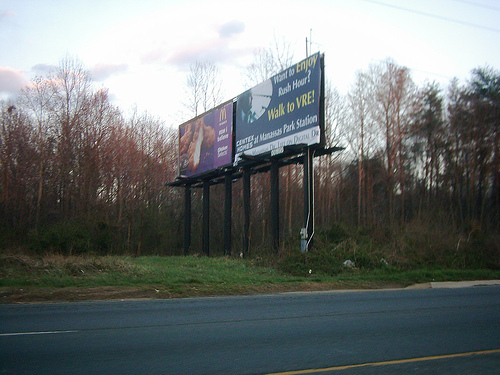 Often created by vinyl, the average billboard that measures 14 by 48 feet will cost about $300 to $600 for the material. This won’t include the designing. When designing the billboard is factored in, this can be another $500 to $1,200 to hire a professional designer. Most billboard advertising contracts will be worked out with a local ad agency such as Lamar Advertising, CBS Outdoor and Clear Channel, the three largest billboard companies in the United States. These companies will handle everything from constructing the billboard to setting up the ad. Many advertising companies will require a minimum amount of billboards or a certain time commitment before they work with you. For example, larger billboard companies may require that you reserve at least five spots in their network before they work with you or they may want you to sign a six to 12 month deal. Fit Small Business, the blog we mentioned earlier, said you have to look out for three things when choosing your billboard to advertise with: how fast people are driving by, the proximity of the billboard and where the typical traveler is going. People driving 40 miles per hour, for example, are more likely to see your ad than if they were driving 70 miles per hour on the highway. Government and non-profit agencies can often receive a discount. Billboard rates are almost always negotiable, and according to one expert on Quora, he said you can often knock up to 50% percent off the rate card.